The Netherlands, of which Holland is but a part, is easy to reach from the UK with a choice of sea crossings followed by a short drive. Lively Amsterdam is the main attraction, but the towns of Haarlem, Delft, Groningen, Arnhem, Maastricht, Breda and the Hague are certainly worth a visit, and for lovely easy cycling try the Hoge Veluwe National Park. Don't forget the famous bulbfields, best seen in Spring. 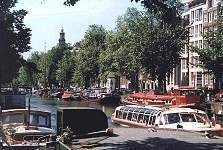 Amsterdam is one of Europe's great cities and major tourist destinations. No matter what you're looking for in a city, you'll find it in Amsterdam. Built on a network of canals, along which are the beautiful tall houses typical of the region, the centre of Amsterdam is compact and largely pedestrian - or cyclist - friendly. Pubs, bars, cafes and restaurants abound, there are boat trips on the canals and sights at every turn. Amsterdam's red light district is world famous, but the night life is much more than that. Theatres, concert halls and venues catering for every sort of music and entertainment mean you are spoilt for choice. Add to this the wonderful mueums and galleries, especially the Van Gogh Museum, Rijksmuseum and the Anne Frank House, and it's easy to understand Amsterdam's popularity. North Holland stretches northwards from Amsterdam, and is a popular tourist area. Visit Haarlem with its beautiful church of St Bavo and the Frans Hals Museum, as well as the narrow streets cluttered with interesting buildings. The rest of this area, is worth driving through with stops to admire the many quaint villages, the windmills, to enjoy the bracing sandy beaches, or to cycle or canoe through the Het Twiske nature reserve or the Kennermerduinen National Park. All around the coast are pretty harbour towns, including popular Volendam, Edam of cheese-making fame, Hoorn, and Enkhuizen with its Zuider Zee Museum. From Den Helder catch a ferry to the pretty island of Texel. To the southeast of Amsterdam is the Het Gooi, an area of woods and heathlands, good for walking and cycling, information on which can be obtained from the main town, Hilversum. South Holland is a land of flat countryside, bulbfields and windmills. The Hook of Holland guards the entrance to Rotterdam's enormous docklands. Rotterdam is a big city, largely destroyed in the last war, but the Boymans-Van Beuningen Museum is worth visiting as is the Kijk-Kubus (an upside-down house!). Den Haag (The Hague), adjoining the seaside town of Scheveningen, is the country's capital, and is a civilised and attractive city with many interesting historical buildings and some excellent museums - notably the Mauritshuis and the Gemeentemuseum. The nearby coast has good sandy beaches and the pleasant resort towns of Katwijk and Noordwijk. The lively university town of Leiden also enjoys pretty gabled buildings set along its canals, and is the best base for visiting the surrounding bulbfields. Delft is much visited for its charming streets and pottery, while ancient Gouda is famous for its cheese and canalside streets. The unspoilt town of Dordrecht is close to the eerie Biesbosch (reed forest) which you can explore by boat or cycle. Historic Utrecht is close to the Utrechtse Heuvelrug a wooded area with excellent walking and cycling. The north of the country comprises the provinces of Friesland, Groningen and Drenthe. The countryside is flat, but green and often wooded, with many dykes. The two main towns of the area are Leeuwarden in the west and Groningen in the east. In Leeuwarden visit the ceramics museum at Het Princesshof. South of here are the lakes and waterways centred on the town of Sneek. In Groningen enjoy the lively nightlife, the bars and restaurants, the large traffic-free centre, its many ancient buildings and the Groninger Museum. The pretty coastal towns of Harlingen and Hineloopen and their nearby beaches are deservedly popular, and from Harlingen take the ferries to the lovely islands of Terscelling and Vlieland, best explored by bike. The centre of the country includes the large Hoge Veluwe National Park an area of heath and woodland, ideal for cycling, and containing the Rijksmuseum Kroller-Muller housing a superb collection of modern art. Nearby is the town of Arnhem, surrounded by the cemeteries of those who fell during the last war and with museums telling the story. The north of this central region is a land of lakes and pretty small villages intersected with waterways. Cycling, walking, boating and canoeing are popular here. The town of Zwolle is worth a visit for its ancient walls encircling the old town and the harbour, as is nearby town of Elburg, once a seaside town but now looking across reclaimed land. The southern Netherlands are made up of Zeeland, North Brabant and Limburg. Zeeland in the west has some lovely beaches and is good cycling and walking country, and Veere is a lively harbour town. Middelburg is the main town here and contains some fine old buildings. Travelling westwards into North Brabant you encounter Holland's first hills, and a change from the Protestantism of the rest of the country to a more Catholic ambience. The only town worth a visit is 's Hertogenbosch, with its cathedral, its broad market square, its museums and, for this part of the country, its restaurants and lively bars. In Limburg are some real hills. Visit the moving National War and Resistance Museum at Overloon. In the south is the ancient town of Maastricht, where old and new co-exist. The old town is full of interesting and lovely buildings, and outside the town is the hill of St Pietersberg with its caves and galleries. Around the town are the green and wooded hills divided by rivers that make this such a good place for walking and cycling.